Despite a liberal catering order, the stuffed mushrooms, butternut squash soup shooters, crab cakes, and caramelized apple and blue cheese phyllo cups at our wedding reception disappeared quickly. Good news for our hungry guests; not such good news for Steve and me as we posed our butts off while everyone else got the party started. I put my heart and soul into selecting that dream team of reception hors d’oeuvres, so of course I was a little disappointed that I only got a few bites. Instead of sulking, though, I came up with a genius plan: recreate the Schatteman wedding cocktail hour for Thanksgiving! So, not only have I been living in box land for the last week as I frantically relocate my kitchen before Thanksgiving, I’ve also been testing and re-testing crab cake and green bean stuffed mushroom recipes. In the end, all this preparation is for a small crowd. Most of my family is staying in their respective corners of the country for this holiday, and I can’t tear myself away from my new kitchen (and unpacking) long enough to join the Schatteman family festivities. New homeowner homebody syndrome. Instead, my youngest sister Tristyn and her hubs are coming up from the big (NY) City. I’m looking forward to a low key weekend of eating, drinking, maybe turkey trotting, friends, board games, more drinking, and plenty of leftovers. 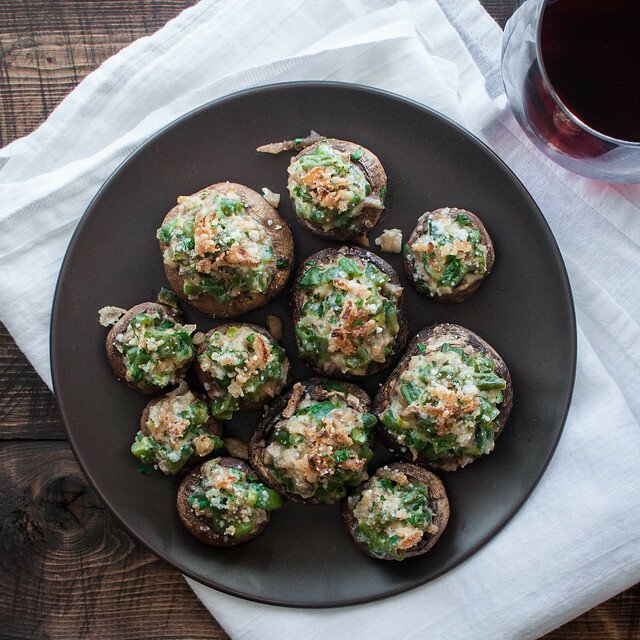 The point of green bean casserole stuffed mushrooms was really to try to eek that classic casserole into my menu, which is already crammed with plenty of sides and appetizers. More than plenty for four people, actually. 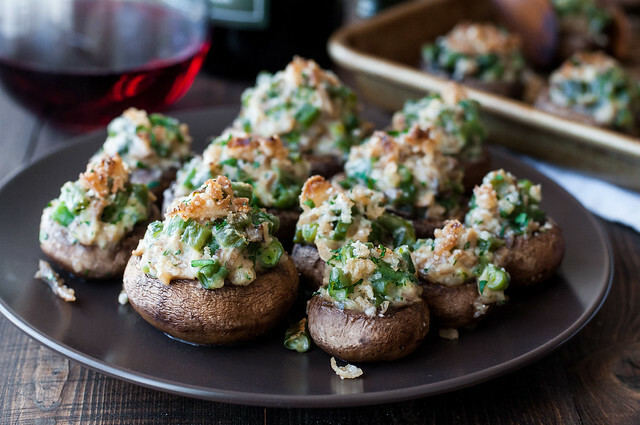 The whole cheesy breadcrumbs and rice stuffed mushrooms thing is pretty boring, but you throw your green bean casserole into a stuffed mushroom, complete with those horribly addictive packaged fried onions, and voila! I’ve hit all the key dishes without adding much extra work. 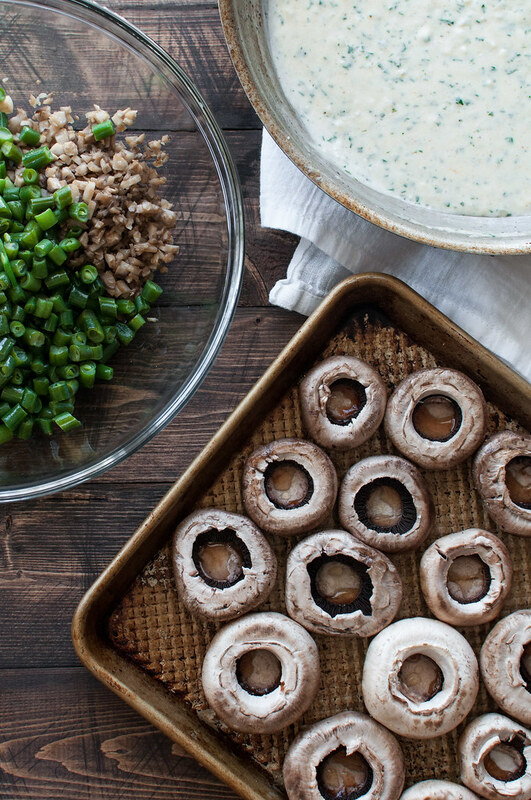 Here’s another scenario which could lead to creamy green bean stuffed mushrooms: say you’re left with half a pan of green bean casserole after the big meal. First, I don’t know why you would be. Even if you’re using that unspeakable ingredient, it’s one of the favorites on the table, at least one of my favorites. I mean, it’s not every day we allow ourselves to consume that much processed comfort food in a single sitting. 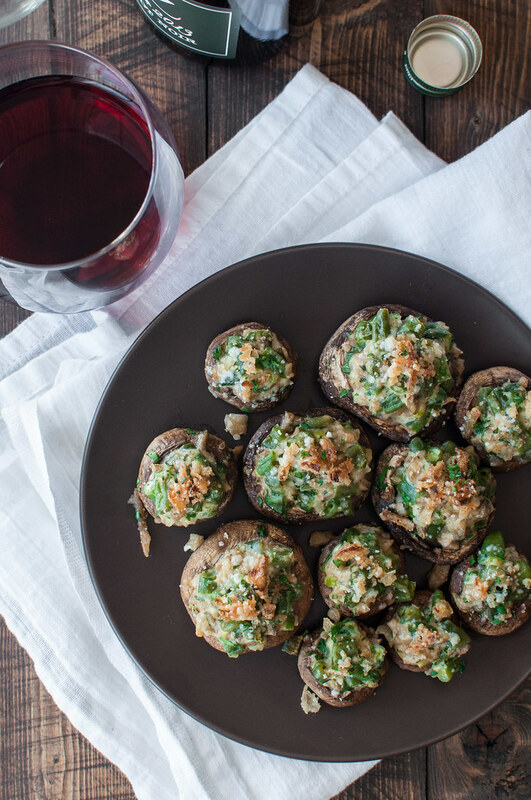 Second, you should turn that leftover casserole into these stuffed mushrooms later in the evening, or over the weekend. Instead of making the casserole from scratch, as in the recipe here, just chop up some cold leftover casserole and throw it into the mushrooms, cooked as directed in the recipe. Then sprinkle them with all the leftover fried onions for the full experience! 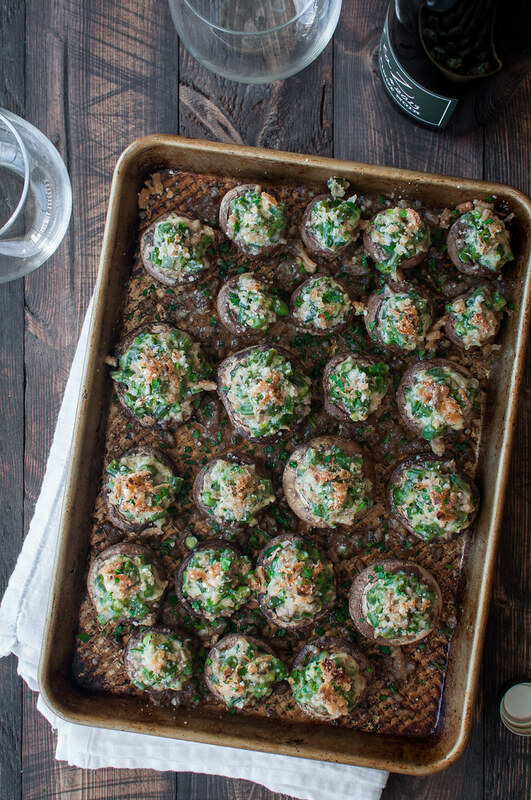 The ultimate holiday side dish turned appetizer! 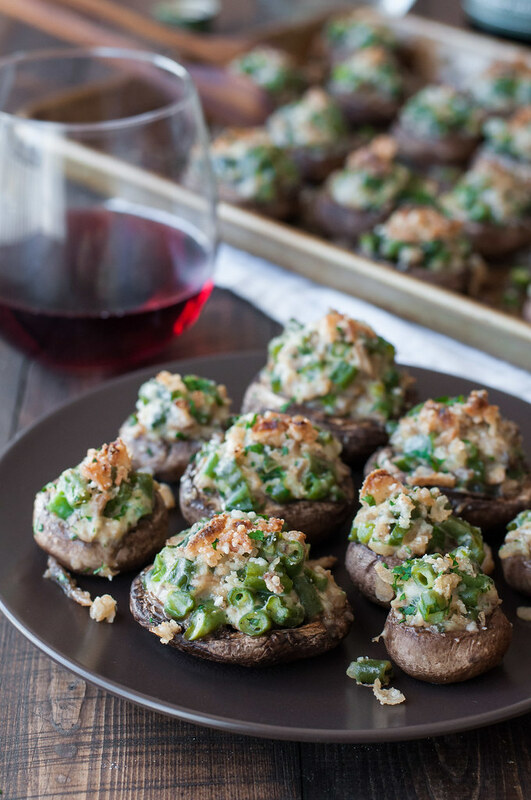 Green bean casserole stuffed mushrooms will satisfy your comfort food craving without leaving you over stuffed before a big meal. Preheat the oven broiler and move rack about six inches from heat. Wipe the mushrooms clean and pop out the stems, using a paring knife to remove any stem stuck in the cap. Chop stems small and set aside. Place caps dome up on a nonstick (or lightly oiled) rimmed baking sheet. Spray or brush tops with oil and sprinkle with pepper. Broil about 5 minutes, until caps just begin to soften and release a little liquid. Set oven to 375 and set mushrooms aside. Heat butter or vegetable oil in a 10 inch skillet over medium heat. Add mushroom stems and sauté, stirring infrequently, until browned and tender, 7 to 10 minutes. Scoop out of the skillet and into a mixing bowl, leaving extra oil in the skillet. If no oil remains, add ½ tablespoon. Raise heat to medium high and add frozen beans. Cook until tender and any water has evaporated, about 5 to 10 minutes. Add to bowl with the mushroom stems. Carefully wipe out skillet with a damp cloth. Heat milk until warm, about 2 minutes in the microwave at 50% power. Melt butter in the skillet over medium low, then add shallots. Cook a few minutes, until tender but not browned, then sprinkle flour and mustard powder into the pan. Stir constantly for 2 to 3 minutes, until flour is no longer grainy and has darkened slightly. Reduce heat to low, then slowly whisk in milk. Raise heat gradually to bring to a simmer while whisking. Adjust heat to maintain a gentle simmer, stirring frequently, until thickened, about 5 minutes. Off heat, stir in ⅓ cup of the parmesan, ¾ teaspoon salt, ½ teaspoon white pepper (a little more if using black), paprika, and parsley. Adjust salt and pepper to taste. Turn the mushroom caps face up. Mix half the sauce with the bean mixture. Pile into the mushroom caps, packing it into a mound. Bake for 15 minutes, until mushrooms are juicy and tender. Mix remaining parmesan with the fried onions. Remove tray from oven, sprinkle mushrooms with fried onion mixture, and bake or broil another few minutes, until browned. Cool slightly before sprinkling with more parsley and serving warm. 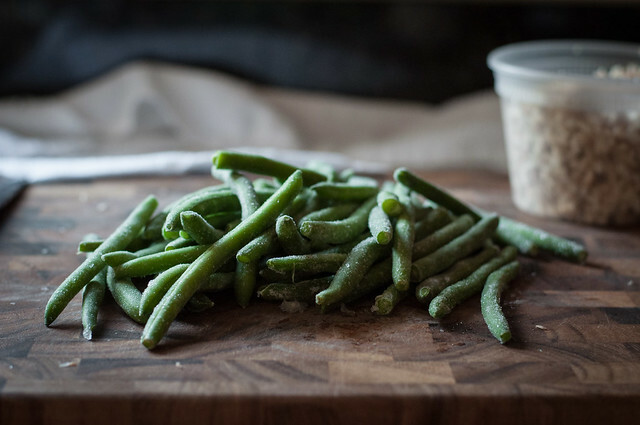 Substitute an equal quantity of fresh blanched or drained canned green beans for the frozen beans. Extra white sauce keeps well in the refrigerator or freezer. If you have extra green bean casserole mixture, bake it in a lightly greased ramekin at 375 until hot and bubbly! Note: This page contains affiliate links. It does NOT contain sponsored content. 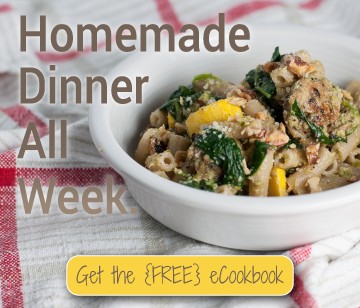 Affiliate links (to products I recommend, on Amazon) offset my ingredient and website maintenance costs, so I can keep bringing you mashup recipes like this one. Thanks!